Ever lost a phone? if yes, then you might have had an awful experience like I did after losing my phone at the restaurant. 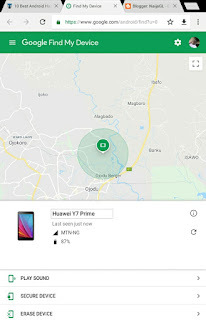 At times, we misplace our phones and the worst part is if we kept them on silent, then there’s no other way you can get it back except using Google’s Find My Phone app. The best part with Android is that if you added a Google Account to your Android device, then Find My Device is automatically turned on. So, whenever you lose your device, just head over to android.com/find in any browser and log in with the same Google account. Now, you can see the location of your device and can further erase all the data remotely, lock it down with a message or make it ring loud (even if it’s in silent mode), provided that your lost device has access to the internet and location is on.